What Food Would You Put in a Time Capsule? Hands down, we must include Chex Party Mix. I know there is nothing groundbreaking about Chex Mix but what happened right before the NFL playoff games is telling. My friend Margaret enjoys lining up her snacks for the big games, so she often mixes up a batch of homemade Chex Mix. He was deeply baffled. Oh, how sad our children don’t know the pleasures of a good old-fashioned Chex Mix hot from the oven all spiced up with as much Worscestshire as you like. Sure, you can buy all kinds of delicious Chex Mix in a bag—original flavor or many varieties some of which are all gooed up with chocolate, peanut butter, cheese, and other flavors. To prove my point that it could be done, I gathered the ingredients, made up a batch and the kids went nuts (pun intended) over the warm and crispy snack fresh out of the oven. I added oyster crackers, adjusted the nuts to our liking and even added a little extra Worcestershire. The Chex Party Mix is long gone but now I am left with boxes of Chex cereals lining my pantry shelf. Guess what I’ll be making for the Super Bowl? And one final note: there are now directions on the cereal box for making the popular mix in the microwave. Don’t go there folks. Hold on to tradition. 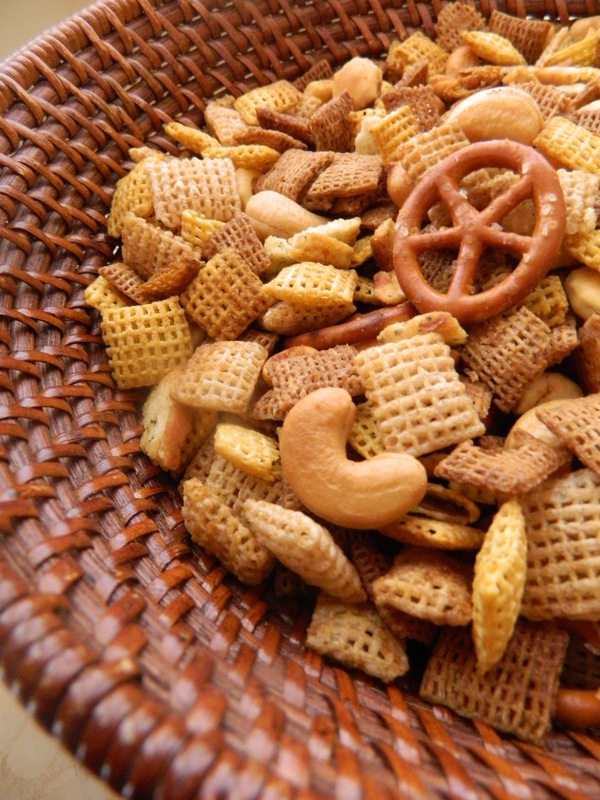 Click here for nutritional information and more recipes for Chex Party Mix. Heat oven to 250 degrees. In ungreased large roasting pan, melt butter in oven. Stir in seasonings. Gradually stir in remaining ingredients until evenly coated. Bake one hour, stirring every 15 minutes. Spread on paper towels to cool, about 15 minutes. Stir in airtight container. What food do you remember from your childhood that you still make today and it fills you to the brim with goodness in more ways than one? 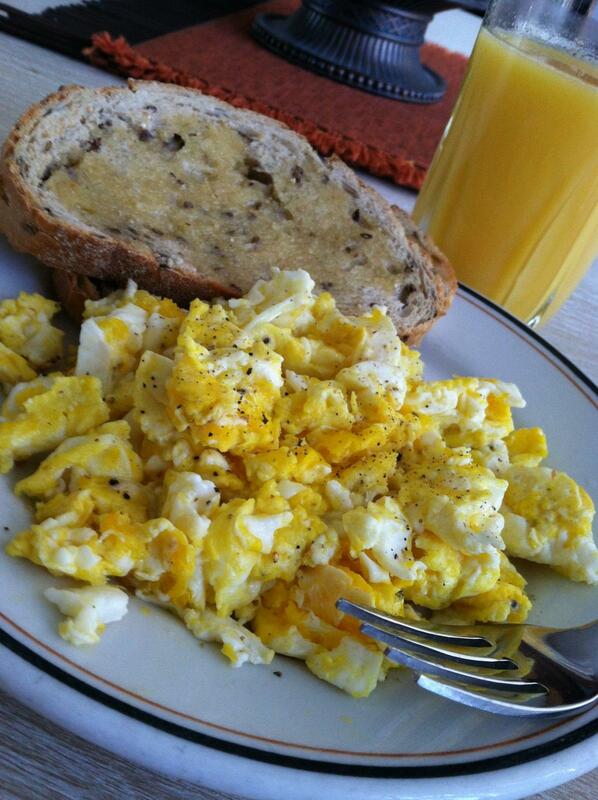 For photographer Cassandra Birocco, it’s her dad’s scrambled eggs known as Joe’s Army Eggs. She snapped this photo yesterday from her Sunday morning breakfast and recalled eating them with ketchup growing up in Western Pennsylvania. Cassandra and I grew up together and nearly everyone in Western Pennsylvania eats scrambled eggs with ketchup — and it’s only the Pittsburgh-based Heinz ketchup. 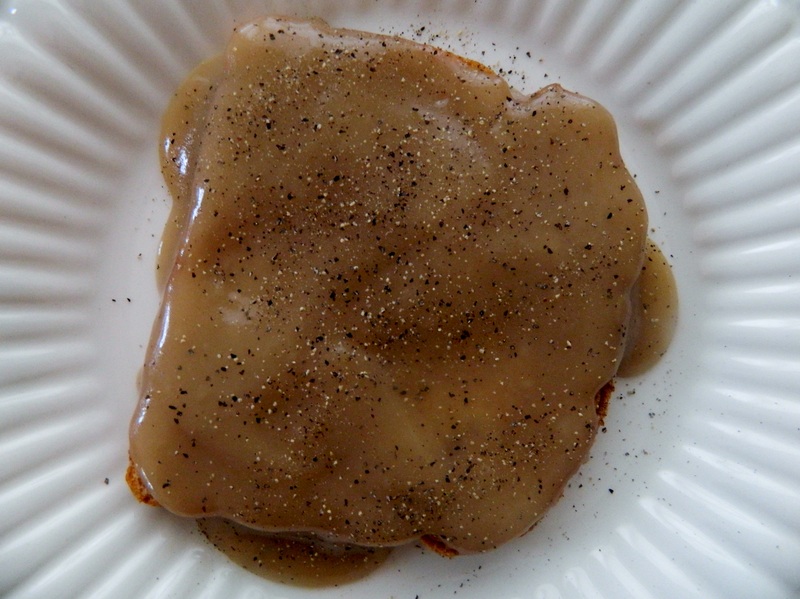 A food memory still vivid to me is simply called Gravy on Bread. After mom’s rib-sticking meal, we took a piece of white bread, poured the gravy on it and ate it. If there was any gravy left the next day, mom would ask if we wanted Gravy on Bread for lunch. I can still picture my brother Johnny sitting at the table and performing his Gravy on Bread assembly. He is 12 years older than I am so as a little girl I found his food rituals fascinating. I just sat and watched not saying a word. He placed the bread on his plate, poured the gravy carefully, then salt and peppered the slab. Then, with utmost precision he cut each piece with a fork and knife, delivered it to his mouth, chewed silently as I watched, and chipped away until there was no more on the plate, using the last piece of cut bread to sop up the remaining gravy. A big wash of Vitamin D whole milk came next. He always had an intense focus on his food. You should see him butter a grilled steak and carve it down to the last bite! Food and the people that made it and ate it, formed us. That’s hospitality. Oh! But what is that robin’s egg blue box tucked into the corner of the refrigerated beer cabinet? Rande becomes even more animated than he already is when tells me that these are Michel’s Parisian macarons. “Have you been to Paris? Have you been to Laduree?” Rande asks with enthusiasm. 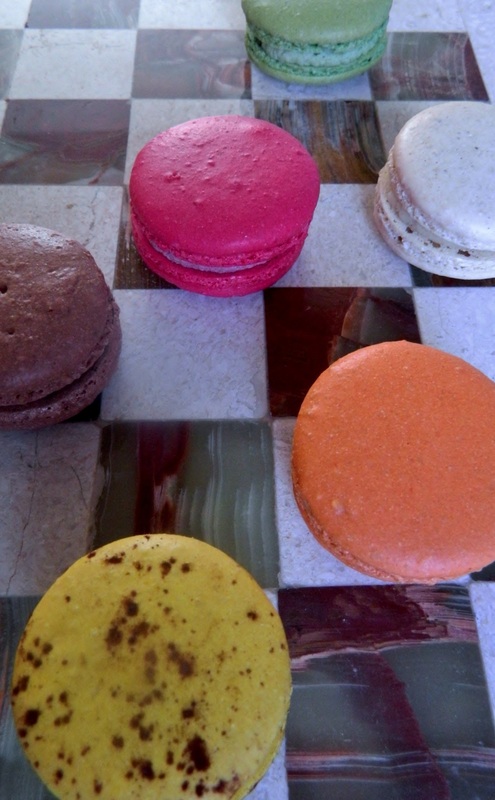 In addition to the wines, I chose the macaron variety box which includes French vanilla, pistachio, raspberry, salted caramel, passion fruit, orange and lemon. As soon as I got home, even before taking off my coat, I lunged into the salted caramel. Mmm….heaven in my mouth are the only words I can find to describe them. Lucky are my family and friends who will enjoy these if they aren’t all gone before they get here. Go to Michel Patisserie at michelpatisserie.com to see his complete selections. 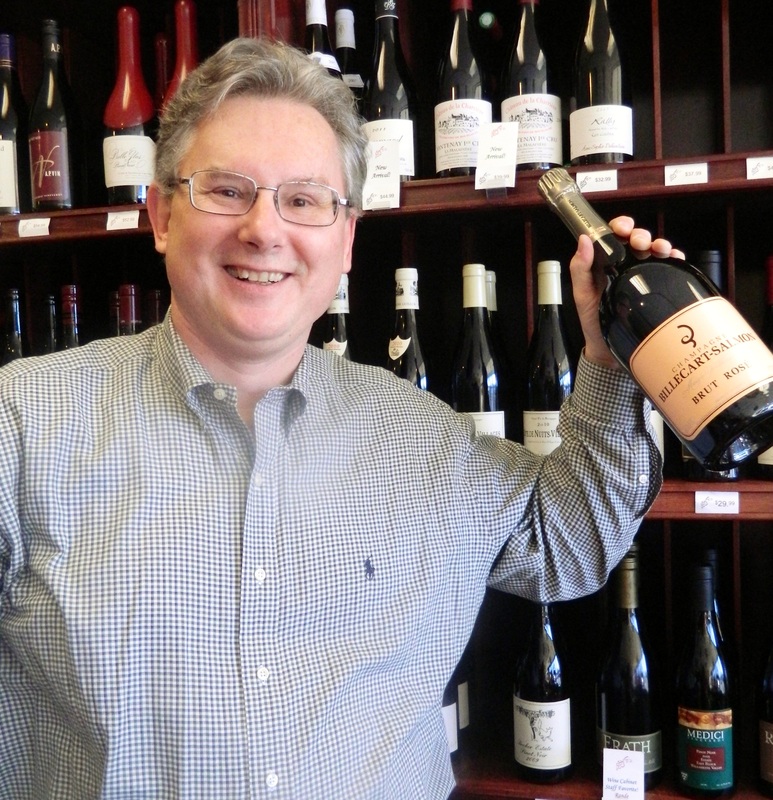 And if you’re local to northern Virginia, stop by the Wine Cabinet, or sign up for their newsletter here. Your January won’t be ho hum anymore. Rande, pictured here, added that a nice wine pairing for Michel’s macaroons would be Moscato D’asti. Rande is holding his favorite rosé champagne, a magnum of Billecart-Salmon. That is “Happy Round Birthday” in German if you are wondering. The “round” birthdays are the ones that end in 0. In Germany and in Scandinavian countries the Round Birthdays are celebrated as great events often with hundreds of guests. 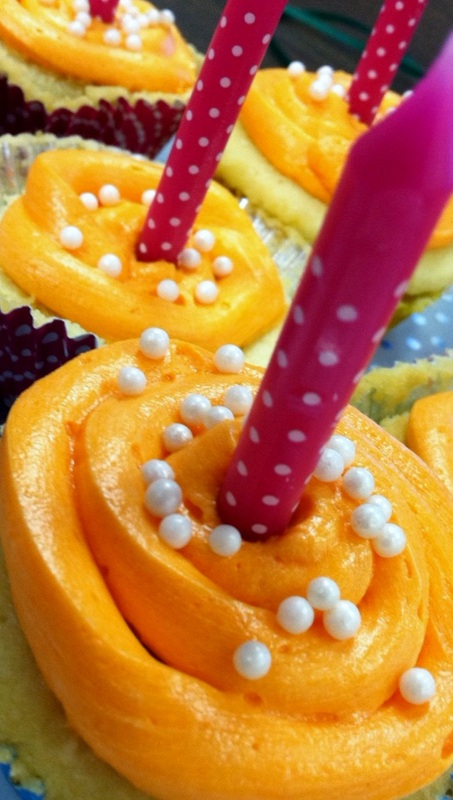 No matter where you live, a Round Birthday is a milestone we all hope to meet. In our office, we celebrated Brenda’s Round Birthday of 70 years. I borrowed a clever idea from my friend Joan who, on the occasion of our friend’ Betty’s 90th Round Birthday, baked 90 cupcakes with candles on each one. 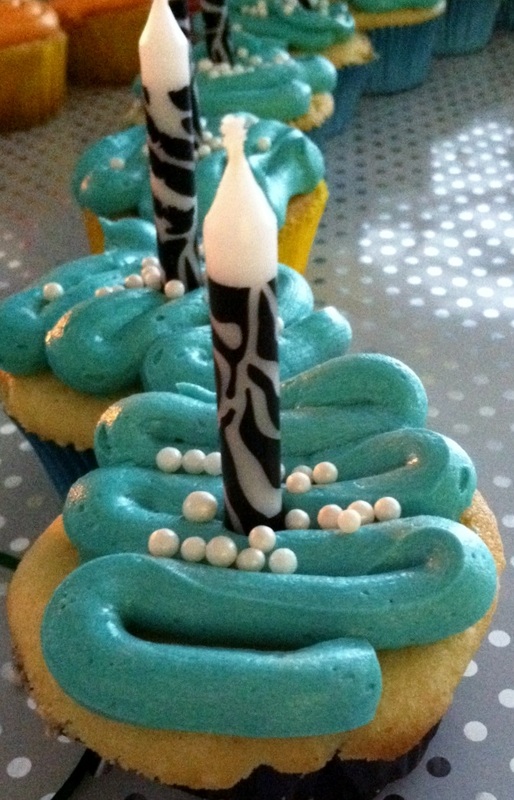 So, I set about baking 70 cupcakes, decorating them in bright colors and putting candles on each. Then, I formed them in the shape of the number 70. It was a hit again! I’ll hope you’ll do it for someone’s next Round Birthday. Hint: Leave plenty of time to light all the candles before the guest of honor arrives. 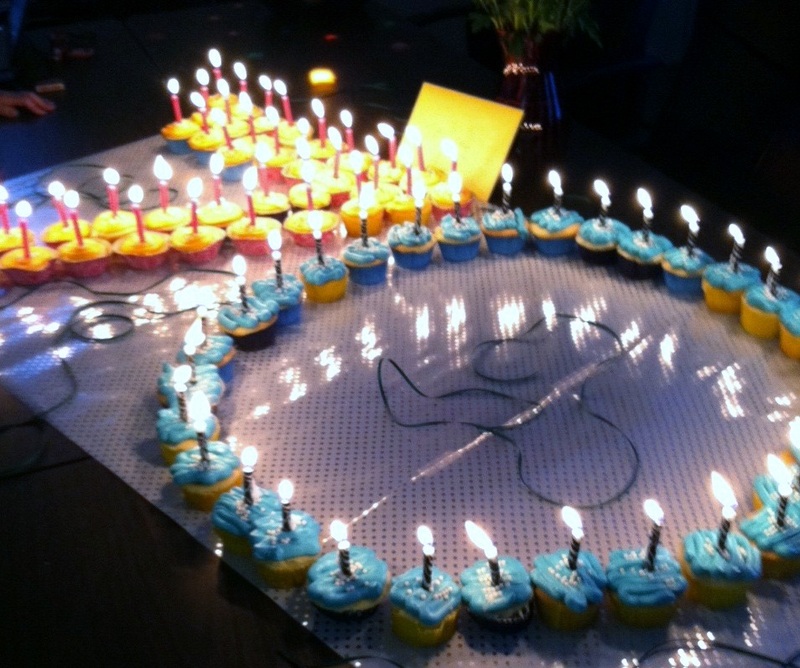 If it’s a really BIG Round Birthday, it could take several people to do the job. For more office birthday ideas, have you read “The Office: Mary Ann and the Beating?” Oh you must! Click here to read. 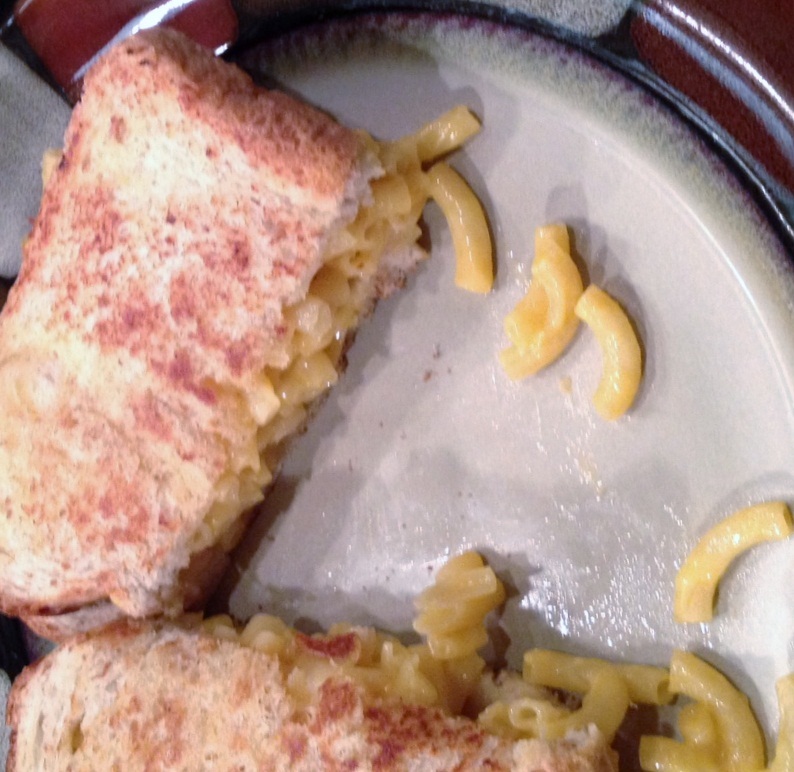 When teens cook, good food happens. Here is the latest from my brother, Bobby G. I love his account of what happened. I caught Karlie making this tonight. She said that she got the recipe from her friend Carly from Johnstown, Pennsylvania. This sure seems like a Johnstown recipe. Cook Easy Mac in microwave according to directions. Spread margarine on two slices of fresh bread. 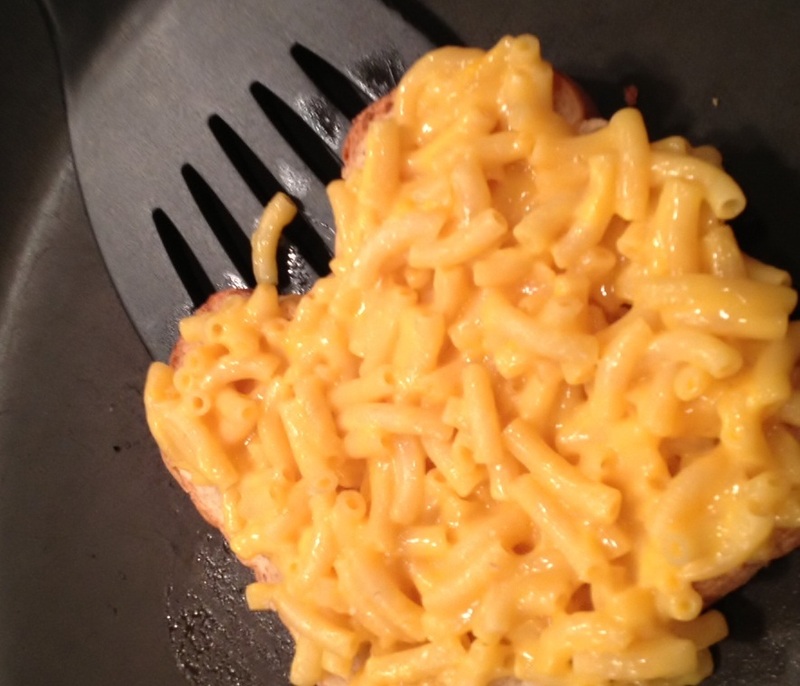 Lay the buttered side down on a hot griddle/pan and spoon the mac and cheese onto the bread. Place other bread slice buttered side up on top. Grill a few minutes until brown, then flip and grill another few minutes. Slice sandwich in half. After a delectable dinner of spare ribs, orzo, roasted peppers (recipe below) and wine, what more could we want? We were sated with warm and comforting food. But, did you ever want dessert but not a whole piece of anything? Maybe you just want a bite of something sweet to top off the perfect meal. Our hostess, Pat, knows. We finished dinner, the plates were cleared and as we sipped our wine and chatted, she surreptitiously went to a dish in the corner of the dining room, grabbed handfuls of red and green M&Ms — both plain and peanut — and literally scattered handfuls of yummy M&Ms on the table right before our eyes. We grabbed like little kids. She knew we only needed a bite of chocolate to finish off her perfect meal. Don’t be surprised if I borrow her idea, so might you. I only know this from what I remember seeing her do. They go perfectly with any meat. Toss peppers with olive oil and salt and pepper and place skin side down on baking sheet. Bake for 25 minutes in 375 degree oven. After 25 minutes, sprinkle with parmesan cheese and broil until slightly brown. Serve immediately. We are pleased to be guests of friends over New Year’s to share in the Tradition of Vasilopita. Our hosts said the bread is to be shared among family and close friends. New Year’s Day falls on the feast day of St. Vasilios (Basil), an important saint in the Orthodox Church. On that day, the family gathers for the traditional New Year’s dinner and the cutting of the Vasilopita — a bread named for St. Vasilios. 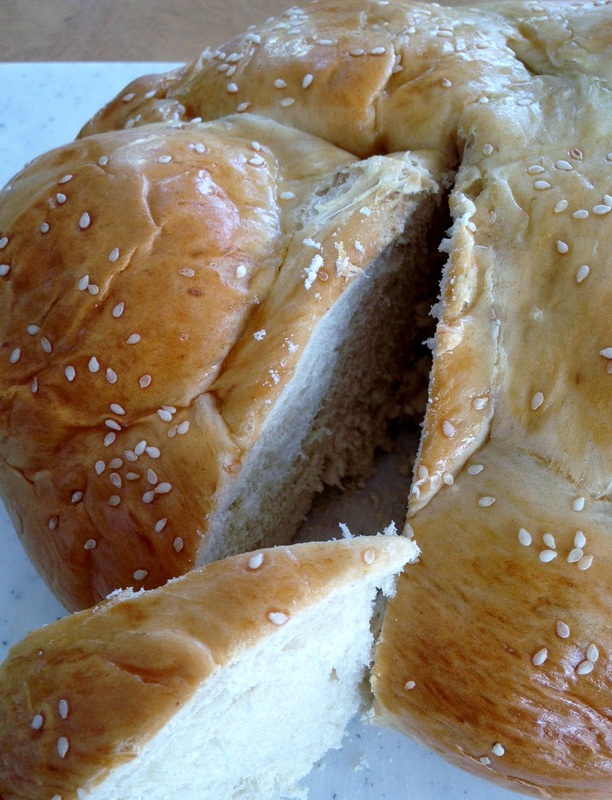 A coin is baked inside the Vasilopita. The head of the family cuts the first slice for the Lord, the second for the home, and then the remainder of the bread is divided equally among family and friends. Whoever finds the coin in his portion will have fortune in the New Year. If the coin is found in the Lord’s slice, the entire household will be blessed. The tradition of the Vasilopita goes back to the Roman Empire when the Roman governor of Cappadocia sent his representatives to Bishop Vasilios of Caesarea to demand gold. The Christians loved the Bishop so they brought him all their gold. He prayed all night to God to save the city. In the morning, the governor went to Bishop Vasilios and demanded the gold. He told the governor the gold belonged to the poor and his love of money would destroy him. Before the governor could even touch the gold, he and his army retreated in a cloud of dust — a miracle! Bishop Vasilios decided the best way to return the gold back to the people was to divide it by placing pieces of it in baked loaves of bread, lest they become greedy and grab more than their share. When each received his share of the bread, he also found his own gold in it – another miracle! Happy 2014! May the year bring you your own miracles.